I’ve been a fan of Chris Guillebeau for a few years now. Even before his first book, The Art of Non-Conformity, came out in 2010, I read his blog. He’s always had inspirational stories and information about how to make sure you’re doing the work your meant to do rather than feeling stuck in a 9-to-5. With the brand new Born for This: How to Find the Work You Were Meant to Do, it’s like he’s moved Art of Non-Conformity to a new level. Some of the base information is re-infroced–like the all important guidance to not let others, whether it’s friends, family, colleagues, tell you that you’re crazy/wrong/misguided in what you want to do. It’s your journey to take and the naysayers shouldn’t have a say in it, especially since they’re usually naysayers because they’re not gutsy enough to try it themselves. Born for This lays tools along with stories of people who’ve made the leap to doing what their passion is as a guideline to follow. Chris is upfront that everyone’s journey is different, but what he presents is food for thought that I think everyone can use. I particularly liked the “Always Bet On Yourself” chapter, which talked about evaluating risks so you can make better choices and have backup plans so you can take chance, and preferably the right kind of chances. A quote that I liked, because it validated some of the choices I was making: “I’ve learned to be bold asking for information from people who I think are doing it right. And I’ve become really good at saying no to the opportunities that don’t bring me joy, or don’t align with my values.” That’s from Sam, a 53-year-old quilt pattern designer. I’ve got much better at both of these in the past few years. I find that you should always ask questions because most people are more than willing to talk. Saying no is important to so you’re not spending time in something you don’t want to do/something that doesn’t fit what you’re doing. Lastly, I loved reading about the Side Hustle. That’s essentially what my writing career is right now. While it’s a business, it’s not what pays the bills (at least not yet). So, for now, it makes money and lets me do what I’m really passionate about. Combined with the information about setting up and growing “You, Inc.,” which is what the Side Hustle. I got some new things to think about as I keep working towards the goal of full-time writer. The final chapter I’ll call out is “DIY Rock Star.” This was a chapter I’d definitely recommend to all my author friends. We all hear about the importance of not only promotion, but making the connection to form a relationship with our readers. There were great tips in this chapter–some of which I was already doing and some that I’ll look to implement in the future. One thing I did recently that was on point was creating the podcast with Will. Not only do we have a blast doing the show, it makes a connection with people and helps build our tribe as we talk about pop culture we love, present interviews with authors and others in the gay fiction world we find interesting, and, of course, talk about what projects we’re working on. 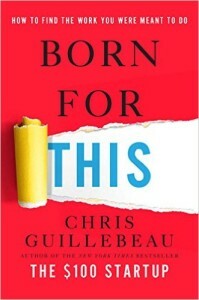 Whether your a long time Chris Guillebeau fan, or new to his work, this is a great book if you want some guidance on striking out on your own path, or looking for some potentially new concepts if you’re already on that path. NOTE: I received a free copy of the book in exchange for a fair review.